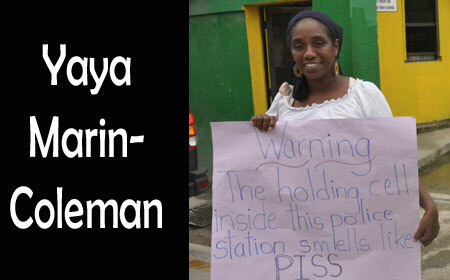 BELIZE CITY–City goers who passed in front of the Precinct 3 Queen Street Police Station today might have noticed well-known activist Yaya Marin Coleman, along with fellow activist Samiyyah Andrewin-Miranda, displaying placards denouncing the terrible conditions at the infamous “Piss House”, which is the name Belizeans use to refer to the station’s holding cells, situated on the ground floor of the police station. Marin-Coleman has turned her attention to what she described as a “violation of people’s human rights” and an eyesore even for the police officers who are tasked with guarding the cell block from time to time. She said that even though the conditions might be the same at police lockups in other parts of the country, she chose that location because it is a prime location on a major thoroughfare which is traversed by many people, including school students, on a daily basis. Marin-Coleman told Amandala that she got a good reception from most members of the public for the seven and a half hours that she had been out there protesting, although she noted that there are still skeptics who question the rationale of her protest. “Someone I spoke to said that the people [who are detained] are locked up for committing crimes and I said, ‘It’s not about that; you’re innocent until proven guilty and officials have a responsibility by the State to keep the place sanitary.’ People would be in there for 48 hours or more and not take a shower, [and] I heard that people are not given an opportunity to call their attorney because there is no phone that can call out – those are violations of people’s human rights”, she indicated. When prodded as to what she hopes to achieve through her stance, “The Agitator”, as she calls herself, replied that it has to do with awareness because many citizens are not conscious that the conditions of the cell blocks are a violation of human rights, and also because those who are affected need to find the courage to speak out about the situation instead of “suffering in silence”. According to Marin-Coleman, a member of the Human Rights Commission informed her earlier today that he is in the process of drafting a press release in support of her position to bring local and, if necessary, international pressure on the Government of Belize (GOB) to ensure that all holding cells in all police precincts throughout the country are refurbished to meet professional standards. The activist told us that she will carry on her campaign every Monday from 8:00 a.m. to 5:00 p.m. until the change – which she is confident will take place based on the “love, energy and overwhelming support of Belizeans” – happens.